This month, I got the unfortunate news that the Daring Kitchen Challenges will end next month. I knew this news would likely be coming, but hoped that it wouldn't. I have been part of the the Daring Kitchen for almost six years now, and in the process I have learned so much about myself as a baker, have improved my baking skills, and have gained knowledge about the baking traditions of other cultures. I will miss having this monthly challenge to look forward to, but look forward to participating in the final challenge next month. This month's challenge was hosted by Ginger-Z, and can be found here. 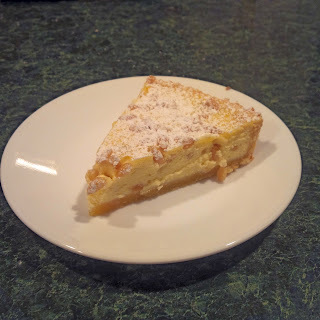 For this challenge, we were asked to bake a Torta Della Nonna. For the pastry crust, I used a Pasta Frolla, and I chose to fill the tart with a ricotta cheese mixture, flavored with pine nuts. The end result reminded me of a light cheesecake, and the pine nuts added a unique crunchy twist! 1. Make the pastry: Place all ingredients in food processor and pulse for 10 seconds. Add a little more ice water, one tablespoon at a time, and pulse after each addition until the dough just comes together. Knead the dough briefly and pat into circular disk. Wrap dough in plastic wrap and refrigerate for one hour. 2. Make filling: In a large mixing bowl, beat together the ricotta cheese, sugar, lemon juice and zest, flour, and eggs until smooth. Stir in 1/2 cup of the pine nuts. 4. On a lightly floured surface, roll out the pastry dough to fit a 9-inch tart pan. Place the dough in the tart pan, and trim the edges around the top of the tart. 5. Pour the filling into the tart, and sprinkle the remaining 1/4 cup of pine nuts on top. Bake for about 40 minutes. When done, the tart should be lightly brown, and a toothpick inserted into the tart should come out clean. 6. Remove tart from oven and allow to cool.